Hobbs, M., & Hynson, Y. (2013). Development and use of Moodle for online student support. Studies in Self-Access Learning Journal, 4(3), 196-207. In the current educational climate in the world today, there is an increasing use of technology and social media for learning, by both students and language teachers. With this in mind, and to meet the perceived associated need for students to have increasing abilities and skills to study autonomously and independently, a new e-learning platform (Moodle) was introduced to Unitec, a tertiary institution in Auckland, New Zealand. 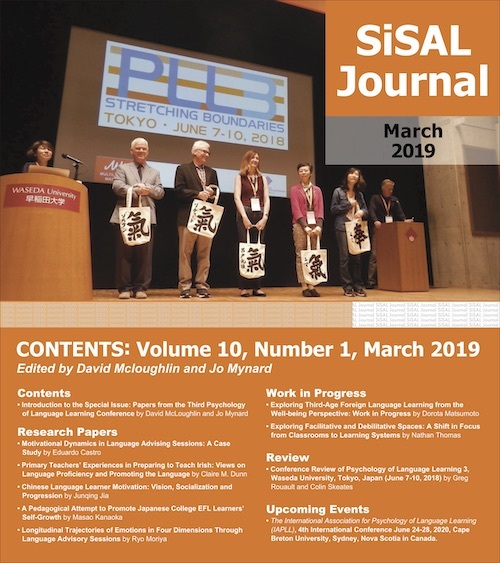 This paper describes how the Moodle site has been developed since inception and how it is used within the Department of Language Studies to facilitate both English as an Additional Language (EAL) for online support and for the development of autonomy. As more institutions move towards using mobile devices and other e-learning technology in classroom-based courses and/or in full time on-line courses, the range of support needs to become simpler, more intuitive and easier to access. This paper will describe and discuss the impact of the introduction of a new e-learning platform as part of a range of ongoing initiatives within one educational institute, to improve course content and outcomes for learners. It will also consider student autonomy on-line, the needs of the students in the Language Studies Department of that institute, how these needs for support were addressed, the development of their student identities, and the results of the new platform so far. It is hoped that this paper will inform, not only our own institution as it continues to develop courses appropriate for the student body of today, but also other institutions who are grappling with maintaining a high quality of service for their students within an increasingly technological world, and lastly tech-savvy students who may only have limited access to ‘one to one’ guidance from learning advisers. Unitec Institute of Technology is a tertiary institution in Auckland, New Zealand. The Department of Language Studies in the Faculty of Social and Health Sciences is spread over 3 campuses, and includes just over 1100 language students studying in four main programmes: Certificate of English (CE), Certificate of Intensive English (CIE), Diploma in English, and an Advanced degree level programme that is split into a variety of courses, ranging from a focus on pure academic studies to practical employment in the workplace. Since 2009, Unitec has embraced a new institutional strategy called ‘The Living Curriculum’ which has key outcome areas of: being an excellent business, innovating in teaching and learning, enhancing the student experience, and meeting the needs of communities. As part of the second key result area, innovation in teaching and learning, it was expected that by the end of 2012 all programs would have a Living Curriculum. This Curriculum has the aim of contributing to new and exciting ways of delivering content to our target market who not only need flexible learning opportunities but also need courses more tailor-made for the future needs of their respective workplaces and key stakeholders. As students and employers needs and requisite education and training evolves, so too does the training and provision of the education and classroom/workplace teaching profession need to evolve and develop. Have integrated approaches to academic literacies as a foundation for learning, innovative assessment, and e-learning content and support. A week-long course of workshops for e-learning coordinators within all departments across the whole campus was run by Te Puna Ako (Department of Teaching and Learning) to help lecturers develop professionally and create Communities of Practice (CoPs). In addition, they also ran a series of regular workshops in which vertical and horizontal guidelines were established to accomplish these aims. Working parties from within the Language Department expanded on these, extending and translating the ideas into practical applications. These were further developed and progresssed during team meetings on Teacher and Professional Development days. Underpinning all this development work were the overall teaching aims of the Polytechnic Institute that all lecturers have to work within; that graduates will acquire a balance between specific, current content and lifelong learning capabilities; achieve career-enhancing educational outcomes which are critically conceptualised and practised; have the knowledge, skills and attributes to face the challenges of the future and to live in a multicultural world; and have the capacity to contribute positively to society, manage their own careers and function competently in changing environments. As is self-evident, many of the aims assume an understanding about, and the presence of, a strong sense of personal autonomy for social, educational and professional purposes. The precepts of this living curriculum allow space for students and other stakeholders to determine what they study, and ensure that the studies are directly applicable to the student and external community. These ideas are supported by Barnett and Coate (2005) who state: “The student has to be given ‘curriculum space’ instead of being ‘boxed in’” (p. 125) and later, “[a] curriculum has to become like so many ultra-modern buildings, full of light and open spaces, different textures, shapes and relationships and arrangements for serendipitous encounters” (p. 129). Digital literacy is an important component in this new living curriculum for most courses at Unitec, so all departments were required to transfer from Blackboard (an online repository for course materials accessible by teachers and students) to Moodle 1.8 within two years, as a decision had been made that the institute as a whole would move to this platform as a base for its interactive tools. It was considered that Moodle allowed much more interactivity with Web 2.0 tools, such as wikis, Hot Potato activities, and interactive quizzes based on YouTube materials. Blackboard only had asynchronous reading and listening materials for download, with occasional synchronous feedback in forums, thus Moodle allowed considerably more flexibility and creativity. While encompassing these ideas above, the development of the Department of Language Studies e-learning and self-access Student Zones, and the scaffolding it affords students as they need it, also helps learners by giving them the support structure they need in an additional way, as Alm’s (2006) states: “It is the careful balance between structure and choice that allows learners to become autonomous” (p. 34). The benefits of online learning being able to assist autonomy acquisition was also found by Apple and Kikuchi (2007). “PGPs use multimedia sources, are content-based, encourage social interaction and therefore socio-cognitive restructuring of knowledge, allow learner autonomy or agency, and provide authentic discourse to link classroom practice with real-world activities” (Apple & Kikuchi, 2007, p. 112). Enabling students to succeed, especially in their first semester, is critical to their success. At Unitec, a few dedicated teachers developed Moodle Student Zones, which are a series of webpages for off- or on- campus student self-access, with a range of resources, materials, and activities that they can choose from and use for extra learning in their own time and place. An additional aim of these was to help develop capability, purpose, resourcefulness, connectedness, and to help the students create their identity (Lizzio, 2006), all of which should also increase their autonomous capabilities. These interactive resources on the web-based Moodle platform also complied with the ‘Living Curriculum’ dictates as outlined above. More importantly, it was simple and intuitive with appeal to visual, aural and kinesthetic learners. From a Survey Monkey IT Needs Analysis of all students in 2011, the first step to learning was found to be the need to easily access available support, not only of language, but also of basic IT instruction. On Moodle, all students are enrolled in the Department of Language Studies Student Zone (DoLS SZ). Since mid-2011, students from the CE and CIE programmes have also had their own slightly easier to navigate Student Zone (CE&CIE SZ), which has graphics linking them to various text-based resources. These graphics are designed to aid access to the materials for all students. This second, shared zone has been set up at the request of CE teachers because the students’ literacy skills are not as advanced, and the demographics are slightly different. Both zones contain IT and language support (specifically an on-line language learning centre) in an index at the top of each page, but the zones differ in other ways, such as the number of links in the index. Most of the support is in the form of webpages (page icons) with screen casts such as short videos that walk the students through the session, usually involving a screen capture of the teacher actively using the website, while adding a voice-over with instruction. Other support is in the form of direct links to web pages (blue emboldened) – see Figure 2. Screen casts have already been identified as very successful instructional support for interactive writing feedback (Hynson, 2012). Students can close the webpage without leaving Moodle. This is very important, as the log-in process is time consuming and frustrating for new learners of technology. The CE and CIE SZ has a total of 7 links in the index including Language Learning Sites and IT Skills and Support for instance Programme Events, Student Stories, and Local Events and Help, plus extra links to a news forum, and some other websites for language learning– see Figure 3. This zone was created in July 2011, as teachers demanded simplified student support more aligned with their students’ needs, for example language support (on-line language learning centre) according to level, rather than skill or grammar. 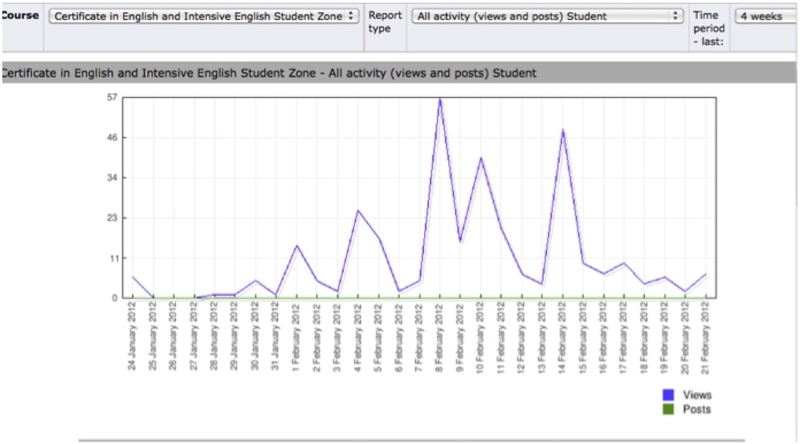 Using the report function of Moodle 2.0, individual, course and total participation can be tracked, and statistics about which links are being used are also provided. The graphs and tables below in Figure 4 illustrate two aspects of Moodle 2.0 report function. From anecdotal evidence (from staff meetings) and a show of hands by teachers after direct questioning of the group, it appeared that only a few teachers were taking their students to the various zones and illustrating their support and use. Students were engaging only when those few teachers had actually modeled and illustrated the zones, shown as peaks in Figure 4. The Posts function (green) was not used by most teachers until approximately a year of use and subsequent familiarity by the teachers and students. From Figure 5 it can be seen that the first two webpages, which include instructions using embedded screen casts, were accessed more than any other activity for IT support. All Elementary students in one class could use Word and write emails, but were previously unable to use them at all successfully before using the site. Grades for writing and vocabulary tests improved after 15 weeks of access, and anecdotal feedback in class further confirmed screen casts’ success. The vocabulary results had also improved when compared with previous years, so this can also be seen as a result of autonomous access to vocab screencasts, as was the writing mentioned above. Similar tables are also available for each student or course, showing the date and time of most recent access and the frequency of viewing of webpages or sites. Blackboard does not show anywhere near as much detail of individual engagement and is highly time-consuming for teachers to learn to use, so previously, only anecdotal evidence was used to monitor the access of Blackboard materials. The preference for Moodle over Blackboard is also supported by Machado and Tao (2007) who conclude that “the Moodle learning management system is the more efficacious and effective learning management system than the Blackboard learning management system” (p. 6). Since this time of course there have been a lot of other developments in the field such as the new and emerging learning management system alternatives, facilitated by further technological advances, for example The Language Cloud, social network substitutes such as Edmodo, Ning, Twitter and Facebook, or web-based approaches using Edublogs or Google sites. Other autonomous vocabulary sites, including Quizlet.com and Socrative.com, have replaced some of the paper-based testing or quizzes on Moodle as well. 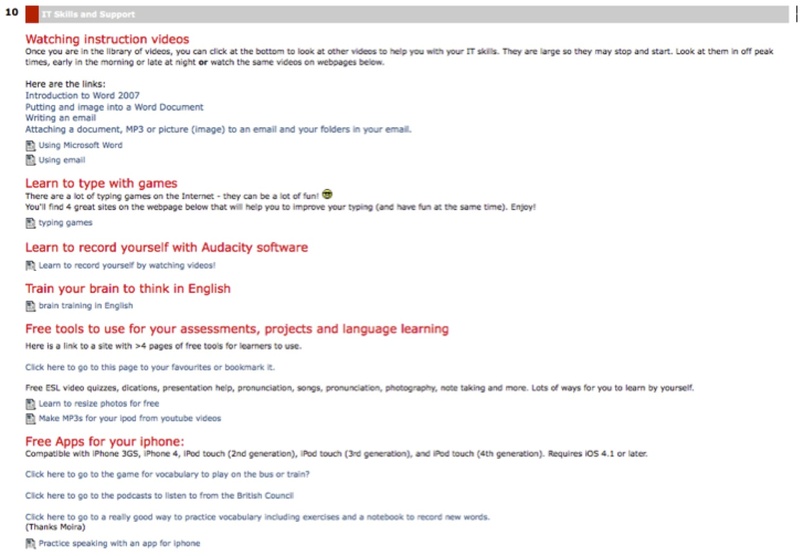 Using the index format on Moodle, a “virtual” Language Learning Center (LLC) is incorporated into the zones with a valuable categorised repository of language sites. In addition, autonomous learning at any time is encouraged by providing students with access to support outside of our current Computer Lab sessions or physical LLC times. It is hoped that these indices and models will help other institutions in the transition from Blackboard to Moodle (or one of the many alternative platforms currently available and being constantly developed). To date, current findings continue to support the zones’ success. Running alongside this for one semester, a designated teacher has a time allowance to illustrate the zones to every class, in the form of a one-off 15-minute mini-lesson with selected sites tailored for each course. It is hoped that this will further engage all students. Moira Hobbs has worked as an ESOL teacher, and is now Manager of the Unitec Language Learning Centre. She is also Academic Development Lecturer for students from a range of vocational disciplines. Both roles exhibit a continuing interest and commitment to helping students achieve their short and long term learning goals. Yvonne Hynson is a full time ESOL teacher working with international students at all levels. She continually introduces e-learning activities and teaches colleagues about their use. She is on a team responsible for the maintenance, standardisation and uptake of e-learning in the department as it transitions to NZQA qualifications in 2014. Barnett, R., & Coate, K. (2005) Engaging the curriculum in higher education. Buckingham, UK: SRHE and Open University Press. Hynson, Y. (2012). An innovative alternative to providing writing feedback on students’ essays. Teaching English with Technology, 12(1), 53-57. Noels, K. A. (2001). New orientations in language learning motivation: Towards a model of intrinsic, extrinsic and integrative orientations. In Z. Dörnyei & R. Schmidt (Eds. ), Motivation and second language acquisition (pp. 43-68). Honolulu, HI: University of Hawai’i Second Language Teaching & Curriculum Center. Unitec (2009, September). Living Curricula. Paper presented to at the Teaching and Learning meeting of Unitec, Auckland, New Zealand. Warschauer, M. (2000). On-line learning in second language classrooms: An ethnographic study. In M. Warschauer & R. Kern (Eds. ), Network-based language teaching: Concepts and practice (pp. 1-19). New York, NY: Cambridge University Press. Warschauer, M. (2004). Technological change and the future of CALL. In S. Fotos & C. Brown (Eds. ), New perspectives on CALL for second and foreign language classrooms (pp. 15-25). Mahwah, NJ: Lawrence Erlbaum Associates. Wilson, K. (2012, February). Managing the assessment lifecycle: Principles and practices in the Early Experience & first year. Paper presented at the Kickstart Conference of Unitec, Mt Albert campus, Auckland, New Zealand.